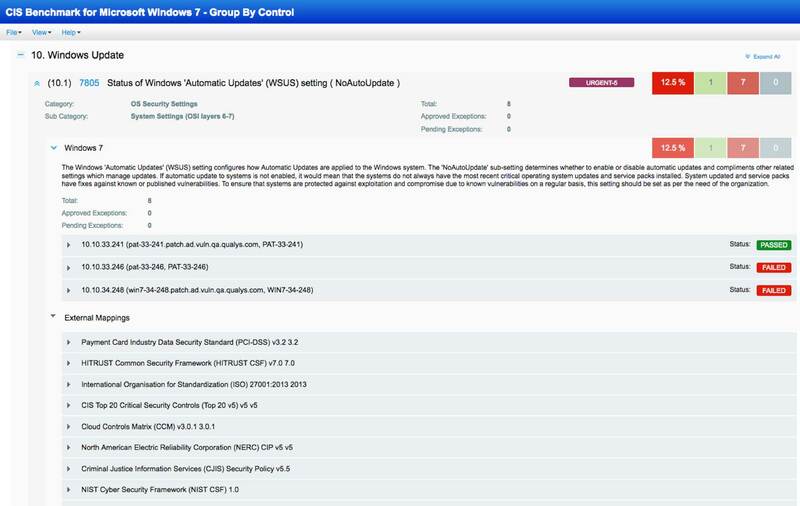 Security Configuration Assessment | Qualys, Inc.
Automate configuration assessment of global IT assets. Both vulnerability assessment and security control assessment capabilities are critical because many regulations prescribe technical control assessments (which drives SCA) and also explicitly prescribe vulnerability assessments. Qualys SCA is an add-on for Qualys Vulnerability Management that lets you assess, report, monitor and remediate security-related configuration issues based on the Center for Internet Security (CIS) Benchmarks. It supports the latest out-of-the-box CIS benchmark releases of operating systems, databases, applications and network devices. Qualys SCA controls are developed and validated in-house by Qualys security experts and certified by CIS. The controls are optimized for performance, scalability, and accuracy. Qualys SCA can be used in IT environments of any size, from small ones to the largest. SCA’s CIS assessments are provided via a web-based user interface and delivered from the Qualys Cloud Platform, enabling centralized management with minimal deployment overhead. CIS controls can be selected and customized according to an organization’s security policies. This eliminates the cost, resource and deployment issues associated with traditional software point products for configuration management. 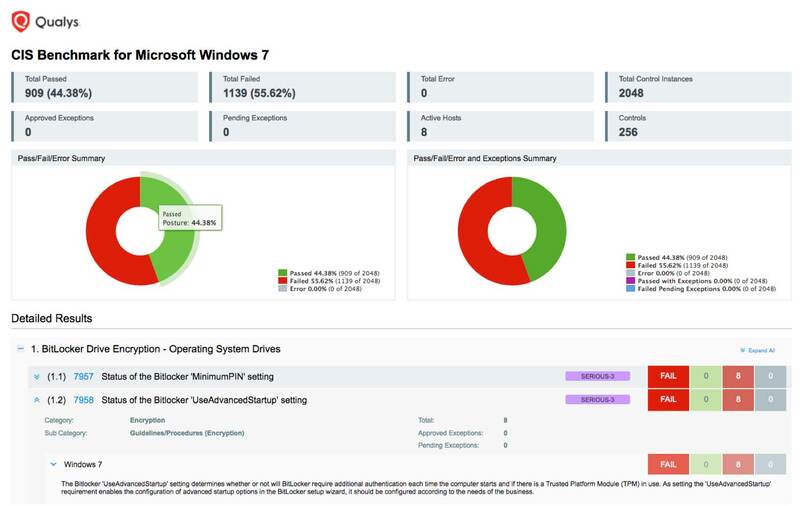 SCA users can schedule assessments, automatically create downloadable reports of configuration issues, and view dashboards for improving their security posture. This brings full circle Qualys SCA’s automation of security best practices behind leading benchmarks, and lets InfoSec teams take a proactive approach towards digital business security. 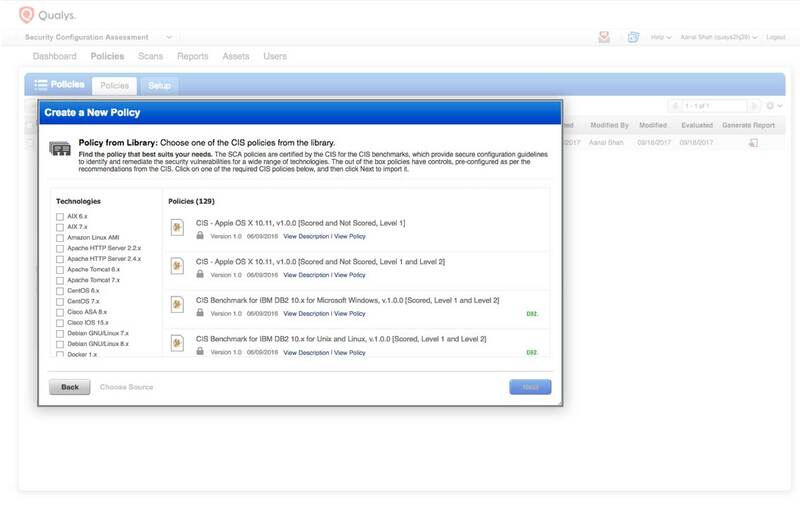 ASSESS: Scan your IT assets and map the asset to the right CIS policy. REPORT: Generate the report showing your control posture against the CIS Benchmarks, Qualys-provided control criticality and remediation information, and the evidence for failure or passing, as well as the references to compliance standards. You can activate and deactivate controls as necessary for reporting purposes. REMEDIATE: Remediate the failed controls, using Qualys-provided control criticality and the control remediation information. Improperly configured IT assets put your organization at an increased risk for breaches. However, it’s common for organizations to rush systems into production with default settings and without basic hardening. Addressing these issues is key for data protection, regulatory compliance, and secure digital transformation initiatives. With Qualys SCA, you’ll be able to automatically and continuously check that your IT assets — on premises, in clouds and on mobile endpoints — are configured securely according to CIS guidelines. This will give your organization a solid foundation not only for security but also for compliance with most regulations like HIPAA and with industry mandates like PCI-DSS. Qualys SCA operationalizes the non-profit Center for Internet Security’s (CIS) Benchmarks by supporting them out of the box and automating the assessment of critical configuration settings on your IT assets against these guidelines. The CIS Benchmarks , applicable to over 100 technologies and platforms, are unbiased and not motivated by profit considerations, and created via consensus by a community of international cybersecurity experts, including experts from Qualys. Lightweight, all-purpose, self-updating cloud agents that reside on the IT assets they continuously monitor, with minimal network impact and no need for scan windows, credentials, nor firewall changes, with no need for the device to be on-line during your scheduled scanning windows.